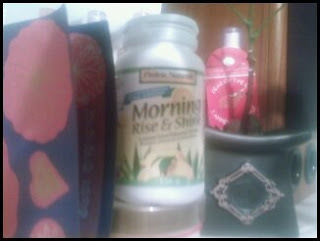 My morning 'Rise and Shine' powder which I add to my Xenergy in the morning. My cucumber/crystal light, bamboo shoot/lemon juice, sweetner, and jello salad. 2 300g packs of Sui Choy, 6 huge leaves of Chinese Cabbage, can of yellow wax beans, can of bamboo shoots, asian dressing, mustard and 7 sheets of Nori Seaweed sheets.